This book absolutely blew me away. The story and writing are both so beautiful it left me breathless at times. I decided to go into this story blind without reading the blurb, based solely on the cover (I know that's kind of terrible) and I'm so glad I did. The plot sounds depressing and sad based on the blurb (now that I've read it) and it is at times, but overall it's a beautiful and touching coming of age story. This is the story of Emily Beam. Emily is attending a hoity-toity boarding school after her boyfriend kills himself at her old public school, something she blames herself for for reasons I won't reveal so as not to spoil the story. Emily is angry and broken and trying to figure out who she is after her tragedy and how to become a regular functioning person again. With the help of a caring French teacher, a couple of interesting friends, and her poetry she reshapes herself into a new person. The first thing I need to talk about because I can't stop thinking about it is the writing. The writing is simply stunning. It is lyrical and soothing and every word is perfectly chosen. I have read some reviews that said the lyrical writing made the reader feel distanced from Emily and her story. I too felt this way at first, but I was quickly so immersed and sucked into the beauty of the writing I didn't care. 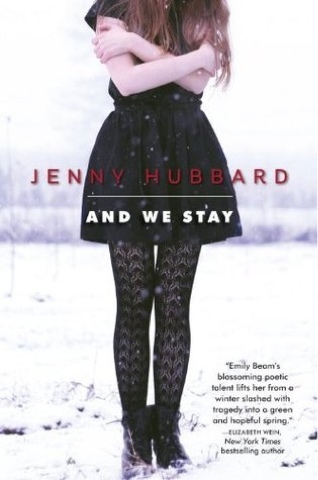 Jenny Hubbard is a lyrical wordsmith and has a ridiculous talent for phrasing and timing. A large part of this book was Emily's poems. One of her poems is displayed between each chapter. I absolutely loved it. Not only were the poems beautiful and eloquent, but they also gave me insight into and allowed me to connect with Emily. These poems allowed me to see inside not only Emily's head, but her heart as well. They made me feel for and love Emily Beam. I feel like I am overusing the word beautiful in this review, but it is really the best word to describe everything about this book. By the end I was moved in a way that few young adult books have managed. I took my time with this book, savoring it and making sure to take in every perfect word. And We Stay reminded me why I love words and stories so much. It's a perfectly told tale about overcoming tragedy and moving on with your life. Jenny Hubbard has a gift and I cannot wait to devour everything she writes.